You are here: Home > From the Lips of Jesus or a Scribal Hand? / Comments Off on From the Lips of Jesus or a Scribal Hand? From the Lips of Jesus or a Scribal Hand? Luke 23:34a is often known as the so-called, “First Saying of Christ on the Cross.” His intercessory prayer has been an indelible saying in the minds of the biblical literate (and not so literate) for centuries. This saying is perennial sermon fodder for pastors on Good Friday. And those who have viewed the poignant film The Passion of the Christ directed by Mel Gibson may be aware that these words are placed on Jesus’ lips, not once, but twice. A few years ago I wrote a paper entitled, “Luke 23:34a: From the Lips of Jesus or a Scribal Hand?” I argued that this saying of Jesus on the cross has significant textual doubt to its originality. It was sometime during the second century, probably the middle to the late part, that this saying was added, probably to a gospel harmony, and from then on it eventually found its way into all the text-types and the majority textual history thereafter. I am not going to reproduce my entire paper here, but I will provide some points of discussion, namely on the textual evidence that shows that this reading lacks important textual support. I want to preface by saying that this textual variant has theological implications on the debate of whether forgiveness requires a transaction; i.e., is it conditional or unconditional? That is, should the offender be repentant-contrite before we can grant forgiveness and thereby have reconciliation? Those who claim that forgiveness is unconditional almost exclusively cite Luke 23:34a as their proof text. If I am not mistaken, evangelical biblical counselors are split over whether forgiveness is conditional or unconditional. In addition, this textual issue has ramifications for universalists who cite this saying as their main proof text. So unpacking the theological cash value for this textual conclusion deserves its own article. There are substantially two readings, a short reading and a longer reading. The following Greek evidence is given in a bird’s-eye format, which will allow us to see the significant Greek witnesses all at once. 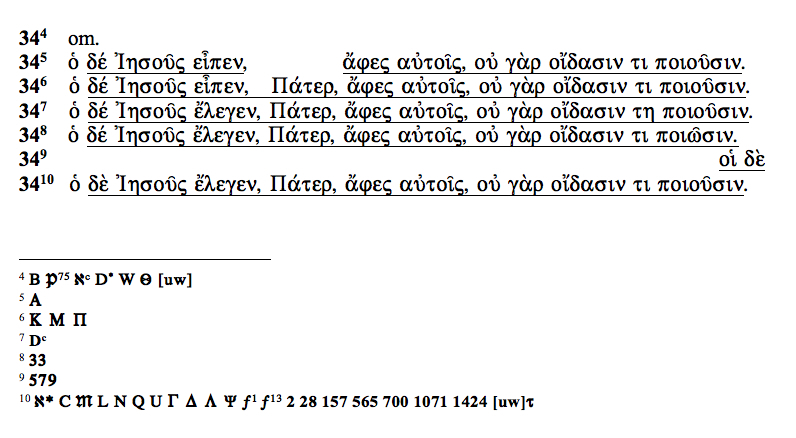 The format here is taken from Reuben Swanson’s very helpful New Testament Greek Manuscripts: Variant Readings Arranged in Horizontal Lines Against Codex Vaticanus (Luke Edition). This is indeed an impressive resumé for its omission. But the litany of important MSS is not absolute and should be qualified (which Petzer acknowledges as well). It should be observed that though the short reading is attested from the second century, the longer reading from early church writers such as Irenaeus, Hegesippus, and the Diatessaron is found in the second century as well (see also ITALA ). And certainly from the fourth century onwards it is evidenced in the Western and other traditions (see IGNTP ). The reliability of Diatessaronic variants is particularly debated, given the dates and nature of the multiple witnesses and the problem of agreeing upon sound methodological criteria for identifying original Tatianic readings. If there is one point, however, in scholarly research on the Diatessaron on which many scholars do agree, it is the reliability of Ephrem’s Commentary for attributing a particular verse or passage to Tatian’s original text. Compared with the longer reading attested namely by the Western tradition, the early textual reality for the shorter reading is shown to be in three out of the four text-types with important representative witnesses supporting the shorter reading: partly the D-text (D it(a)(d) sy(s)), B-text (B P75 sa bo(pt)), C-text (W). But noteworthy are the MSS that attest the longer reading: Aleph, A C it(b) sy(c) bo(pt) f1 f13 and the early writers as listed above. All these witnesses, however, belong to the same text-type. The evidence is thus genealogically limited. The pattern is more or less the same in the third century, with the reading occurring in Origen, Hipolytus of Rome, the Latin manuscripts c and e, which represent the earlier African form of the Vetus Latina, as well as the Curetonian Syriac version. All this evidence belongs to the Western texts with Origen the only exception. In contrast, the diversity of the documentary evidence gives substantial weight to the shorter reading and thereby would strongly suggest a secondary origin of the longer reading. But the external documentary evidence cannot be considered definitive without an honest evaluation of internal considerations, which can be complex, yet extremely significant to the conundrum of this variant. But internal consideration is for another day, however, I did argue in my paper that there was likely a scribal numerical motivation for this interpolation. I direct the reader to a discussion of this at the Evangelical Textual Criticism blog here. The Non-Variation of this Variant. I want to mention one other point. There is the prevalent suggestion that the result of its omission in important MSS is due to an anti-Judaic bias of particular scribes and church leaders in the early church. This is the most significant argument that views Jesus’ prayer as an early excision; and given that Codex D in Acts has been demonstrated to contain an anti-Judaic bias, it is a worthy point for further examining the validity of the claim. One observation that I would like to adduce is that if this is an excision, it is difficult to explain its omission in toto from an anti-Judaic tendency of a scribe. There are examples in which over-pious scribes in the copying process would omit a single word with theological, pious, or “harshness” effects. But also, more common would be the phenomenon of scribes to alter or replace the “difficult” word; or at least to mollify its affects by adding words or omitting some form of syntax, etc. Further, in our case, we are not speaking of only a single-word variant, but an entire clause. Surely then, we should see at least one example of a witness altering Jesus’ prayer for theological reasons. But this is not the case; the witnesses either omit the prayer all together, or it is all intact. This should be qualified by the example of Codex A since it leaves out “pater”; but even in this case, the omission of pater does not suggest any anti-Judaic bias. Not to mention the insignificant differences of the verbal form of poiosin in MS 33, and as well the verbal form of eipen found in K M P A. It would certainly be an anomaly that this apparent theological tendency would have no theological variation within the clause itself. The consistency of the witnesses either omitting the clause completely or consisting of no substantial change when it is included, demonstrates that it is more likely an insertion into the transmission process, than it is an excision. In my estimation, given the judgment of the weight of both the external and internal support [internal support was not covered in this blog post], it is reasonable to place about a 75-90% degree of probability that the longer reading is a scribal insertion early into the transmission history. The attestation among text-types and the diverse early geographical witnesses and their genealogical weight strengthens the probability of the shorter reading being primary. 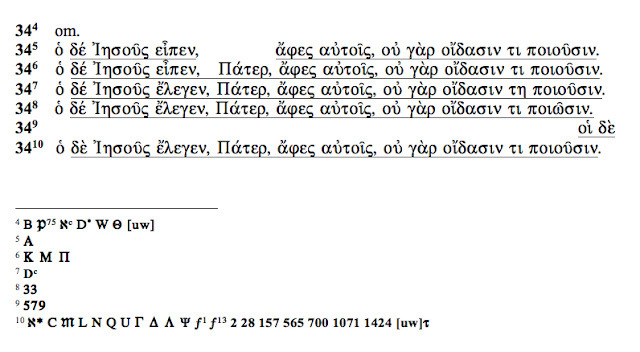 Whereas the longer reading is attested primarily early on in only the Western text. Not to mention the nature of the Western texts often introduces traditional readings. Extra-biblical Jesus-logia in the first couple of centuries would explain the addition of the words. And this would be consistent with the tendency of the early church to add logia than to omit it. And in this case, if the numerical motivation theory is correct [see again here], it was first introduced most likely into a gospel harmony or some form of collection of sayings that were harmonized before it entered an actual place in Luke. Concerning the argument that this reading was excised early because of anti-Judaic bias, in this particular variant, it is not a sufficiently cogent reason as explained. Up until the second century, the shorter reading was read widely. It was until sometime during the second century, probably the middle to the late part, that the longer reading was added and from then eventually found its way into all the text-types and the majority textual history thereafter. Reuben Swanson, New Testament Greek Manuscripts Luke. London: Sheffield Academic Press, 1998. 396. Jacobus H. Petzer, “Anti-Judaism and the textual problem of Luke 23:34”, Filogogia neotestamentaria. 5 no 10 N 1992, 199-203. Adolf Jülicher, ITALA: Das Neue Testament in altlateinischer Überlieferung. Nach den Handschriften hrsg. III Lucas-Evangelium. Durchges. und zum Dr. besorgt von Walter Matzkow und Kurt Aland. Berlin: Walter De Gruyter, 1976. 264. The American and British Committees of the International Greek New Testament Project. Edited., The Gospel According to St. Luke: Part Two Chapters 13-24. Oxford: Clarendon Press, 1987. 217-218. Joël Delobel, ‘Luke 23:34a: A Perpetual Text-Critical Crux,” Sayings of Jesus: Canonical and Non-Canonical: Essays in Honour of Tjitze Baarda (ed. W. L. Petersen, J. S. Vos, and H. J. de Jonge; NovTSup 89; Leiden: Brill, 1997) 29. J. H. Petzer, P. J. Hartin, Eds. Text & Interpretation New Approaches in the Criticism of the New Testament. Leiden: Brill 1991. 56. Thomas M. Bolin, “A Reassessment of the Textual Problem of Luke 23:34a,” Proceedings: Eastern Great Lakes and Midwest Biblical Societies 12 (1992) 131-44. And see Rendel J. Harris, Expositor. VIII: 7, 1914 333-34. Eldon J. Epp, The Theological Tendency of Codex Bezae Cantebrigiensis in Acts. Cambridge: Cambridge University Press, 2005.